Champions Hoppers suffered their second defeat of the season against a determined Billingham side who capitalised on some lapses in defence and at times indifferent handling. Head coach, Paul Arnold, not included in the matchday squad, said: “We made a few changes today which did not work out in some cases and all credit to Billingham who took full advantage. Hoppers started well enough and scored the first time they got hands on the ball as James Fitzpatrick’s break was finished by Connor Trueman but Jobe Roxby’s kick was wide. Poor receipt of the kick off gave the home side possession and the lively home backs put the away defence to the test and, when Fitzpatrick was despatched to the sin bin, Billingham took immediate advantage and wing Tom Briggs was in at the corner to level the scores. Hoppers responded and a half break from Mark Murray put Trueman in for his second and Roxby’s kick was good. Unusually, Hoppers’ pack conceded two strikes against the head gifting possession and territory before a tap penalty caught out the defence and home No.8 Dan Dixon powered over and the kick levelled the scores. Hoppers’ pack started to get their act together and, from a scrum penalty in the opposing 22, scrum half Scott Jordan forced his way over. Billingham then mounted more attacks which were well defended but at the expense of another yellow card, this time for Sam Gale, but Hoppers led 17-12 at the break. The lead was short-lived as indifferent tackling let in replacement Liam King to equal things up and, after Hoppers had missed a gilt-edged try opportunity after a run from Niall Crosley, Dixon again broke tackles to score and kicker Finney put his side ahead for the first time at 24-17. Hoppers rang the changes from the bench in the front row and a run from Oga Mabaya and a dropped ball allowed Fitzpatrick to touch down in the corner to reduce the deficit. 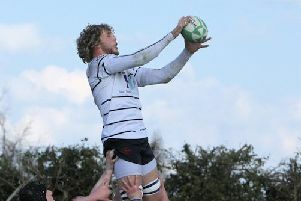 But a pinpoint kick from home stand-off, Peter Evans, put in wing Matt Kirby and the kick stretched the lead to 31-22. With 15 minutes left, Hoppers were now dominating in the tight and Gale was in for an unconverted try and the comeback looked on the cards from a series of five-metre scrums and a yellow card for the home tighthead prop, only for Hoppers to inexplicably lose control of the ball in an attempted pushover and Billingham wound the clock down to secure the win.